The mass rollout of Wifi over the past decade has been phenomenal as to how integrated it has become in all facets of our society and our personal lives. Yet few have asked the most important of all questions, ‘Is it Safe?’At what levels does ever increasing Wifi become dangerous to human health? Can or is it affecting our electronic bodies, our well being and our abilities to think? And to what degree, if any, does invisible radio and microwave frequencies begin to affect our own DNA structures? Federal and Global regulations only deal with thermal heat exposure caused by laptops and such.They completely ignore the real dangers of low frequency radiation. An example to compare the two is that you can microwave your food yet the inside of the box stays cool because radiation only cooks the food at the cellular level as opposed to a regular oven that heats the whole box with conventional heating. This is one of the major Big Lie’s being perp’d on us with WiFi radiation to omit critical measurement to assure us WiFi is safe. Governments and Big Telecom have gotten away with foisting Wifi on all knowing the deep health risks yet due to the difficult legal connections between invisible radiation, the length of time it takes to get sick from WiFi exposure and the legality escape clause of ‘plausible deniability’ they have continued on with blanket immunity. Additionally, in Big Business where no one goes to jail and the regulators are in bed with the corporations, they can hide inconvenient truths from the public, free from fear of prosecution (see Banksters). In the previous TABU, ‘Your Mind, Their Control’, we covered serious issues relating to powers being used covertly to access our minds through the subliminal use of radio or microwave frequencies to sell products and possibly social engineer large groups of people (make us fear, have anxiety, be lethargic and unquestioning to the PTB, impulse shop, etc.) without the individual even knowing deliberate programming has taken place. All that are exposed to WiFi (who isn’t?) need to read a critically important secret document entitled ‘Silent Weapons for Quiet Wars‘ at the end of this piece. Electromagnetic Spectrum – This diagram shows the electromagnetic spectrum, ionising and non-ionising sections, and typical sources of electromagnetic fields. Just as a refresher course — electromagnetic radiation consists of an electrical field plus a magnetic field which each oscillate perpendicular to one another as they travel through space. Amplitude is the height or breath of the wave. As said above, frequency is the waves per specific time frame, usually seconds, from extremely low frequency radiation (ELF) which have longer wavelengths (longer wavelengths are measured in megahertz) up to short gamma rays where the wavelengths are extremely close together. Rays with shorter wavelengths can carry more information and more energy. 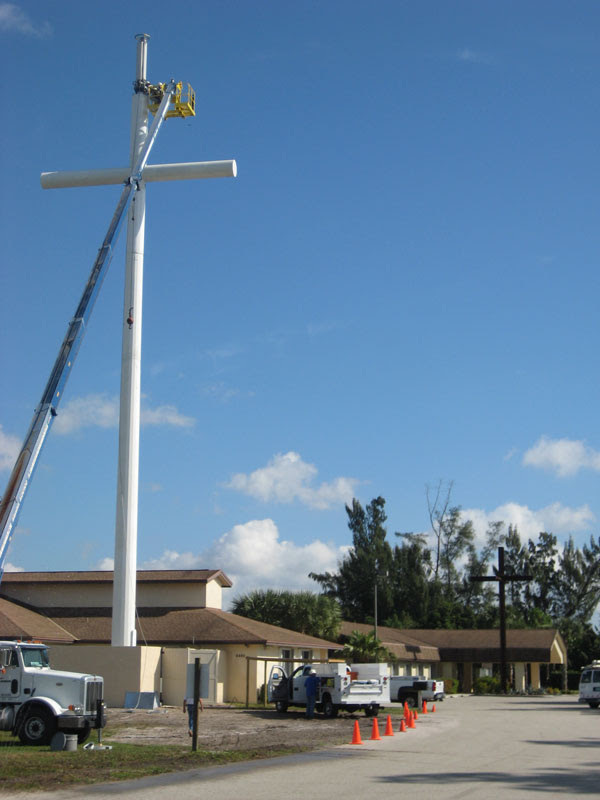 There are two factors to be aware of in regard to wireless technologies. There is the radiation between handset and base station and then there is the information-carrying radio wave (ICRW). 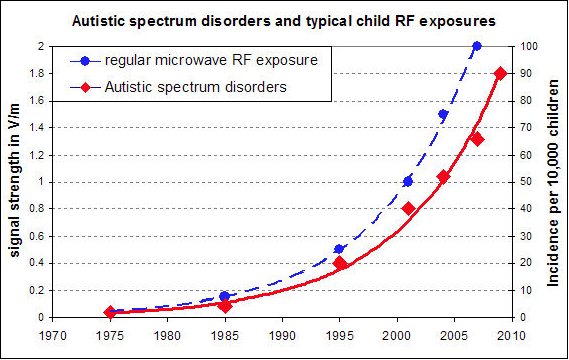 Microwave radiation carries the voice/data information by means of modulations. Scientists are now observing that pulsed information transfer by microwaves triggers biological effects. (2) Even the lowest pulsed frequency might not be safe. Wireless technologies pulse radiation in an organized fashion and these pulses interfere with the various biochemical processes going on in the body. (2) Just as electromagnetic interference from wireless technologies interferes with an airplane’s or a hospital’s equipment — so too with our inner processes. We are electrochemical/electromagnetic creatures, as can be experienced when hooked up to a electroencephalogram (EEG, a test that measures and records the electrical activity of the brain) or an electrocardiogram (EKG or ECG, a test that checks for problems with the electrical activity of the heart). Since Wifi is everywhere and everyone has sold out to its use it is difficult to mitigate the effects. One way is to wire your homes with ethernet cables, switch your phones back to old land lines or order wireless phones that broadcast less radiation (source), look on the website Antenna Search (source) to see what cell towers are in your area and get your home, office and schools to have a EMF (electro magnetic frequency) reading done.
. The amazing story of Dr. George Carlo’s team of blue ribbon panel experts in 1999 conducting the largest study ever for wifi radiation in cell phones FOR the communications industry and found significant radiation impacts, mostly affecting children. 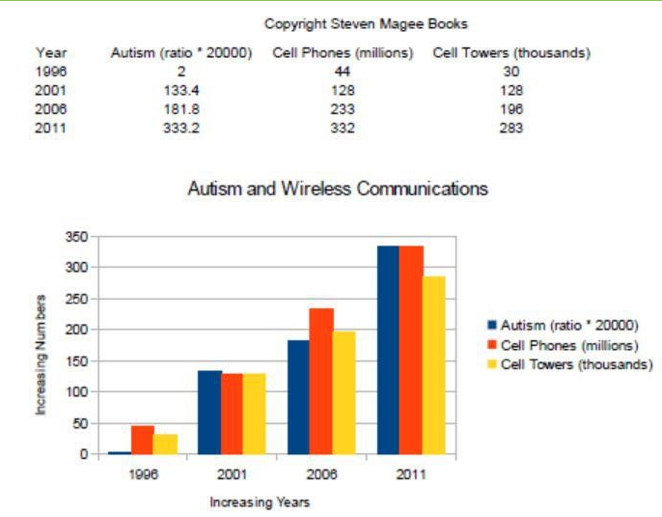 The results were buried by the Big Telecom Industry in 1999 so Dr. Carlo wrote a book about this coverup called: Cell Phones. “George Carlo, PhD, JD, is an epidemiologist and medical scientist who, from 1993 to 1999, headed the first telecommunications industry-backed studies into the dangers of cell phone use. That program remains the largest in the history of the issue. But he ran afoul of the very industry that hired him when his work revealed preventable health hazards associated with cell phone use. Over the past few years a true hero, Barrie Trower has endured the attacks of global corporations, media and governments to bring out his scientific findings about the harmful affects of LMF radiation. His focus has been on the effects of Wifi in schools with children and it is absolutely chilling what he is finding. Live Analysis of Blood being Altered by Wifi Radiation. Researchers increasingly track variations in health outcomes across counties in the United States, but current ranking methods do not reflect changes in health outcomes over time. We examined trends in male and female mortality rates from 1992–96 to 2002–06 in 3,140 US counties. We found that female mortality rates increased in 42.8 percent of counties, while male mortality rates increased in only 3.4 percent. Several factors, including higher education levels, not being in the South or West, and low smoking rates, were associated with lower mortality rates. Medical care variables, such as proportions of primary care providers, were not associated with lower rates. These findings suggest that improving health outcomes across the United States will require increased public and private investment in the social and environmental determinants of health—beyond an exclusive focus on access to care or individual health behavior. Using a laptop with the WiFi turned on may damage sperm, according to a landmark study on the effects of microwave radiation on sperm. The study was presented at the meeting of the American Society for Reproductive Medicine in Denver, Colorado. “This is the first scientific study showing that a laptop computer connected by WiFi may damage DNA and decrease sperm mobility in only four hours,” said Conrado Avendano, Research Director at the Nascentis Reproductive Medical Centre in Argentina. Previous studies on microwave radiation from cell phones found that the radiation from a cell phone can decrease sperm quality, and advised against men carrying cell phones in their pant pocket. This new study is the first to investigate the impact of microwave radiation from wifi-enabled laptops on sperm. In four hours of exposure, the scientists found decreased sperm motility and DNA damage. In public schools across Canada, some children are reporting racing heart rates while in school. The Safe School Committee has received letters from parents who are frightened and confused. Their children are undergoing extensive medical testing but getting no answers from doctors. In Simcoe County, one young student was scheduled for exploratory heart surgery at Sick Children’s hospital in Toronto to find out why she was having heart problems. Once the girl was out of school for the summer, the symptoms disappeared and the surgery was cancelled. A recent peer reviewed study in the European Journal of Oncology proved again that microwave radiation can alter people’s heart rate. An investigative news report on Global Television demonstrated these sudden changes at microwave radiation levels far below Health Canada`s Safety Code 6. Click here for a Global News report demonstrating how people’s heart rate can change when exposed to microwave radiation from devices such as WiFi. Click here for the most recent study proving low-level microwave radiation can affect the heart. Click here to watch a video presentation of the study. The regulators of our health and safety as to the transmission of wireless energy waves has been given to globally acceptable standards by the International Commission on Non-Ionizing Radiation Protefction (ICNIRP) with full approval by our Federal Communications Commission (FCC). These standards do not even cover the long, low wave micro and radio frequencies except for the industry standard of if someone feels warmth from their laptop for over one hour they should stop. I kid you not. Additionally, microwave pulsed alternating current energy does not even heat (its not hot when you stick your hand in a microwave but is when put in an oven), so in effect there is no standard at all set for the safe use of wifi low magnetic frequency use!!!! What our daily bath in WiFi radiation looks like if we could see it. The Big WiLie; Has anyone asked “Is It Safe”??? As you can read below the health safety standards that were set for wifi, cell phones, smart meters, etc. only deals with high frequency radiation and thermal radiation. Doctors and scientists are screaming to disclose the fact that it is the non-ionizing low wave, non thermal radiation that is causing cellular destruction in our bodies that are resulting in severe increases in autism in children and low fertility rates. At the end of this you can read a document entitled ‘Silent Weapons for Quiet Wars’ which is alleged to penned in secret as to hidden agenda by our Shadow Government (source) to depopulate the world’s population using exactly these type of means. Thermal Heating vs. Low pulsed non-ionized radiation. Thus, with the new ‘safety level’, effects were recognized only if they showed ‘heating’ or ‘thermal effects’ This is the stance of Big Telecom, Military, Industry etc. Heating does occur at much higher levels than what a cell phone etc. can typically cause you to notice. However, heating still occurs at low levels as cells are being oscillated back and forth millions or billions of times per second, from multiple devices at multiple frequencies, 24/7. Even if heat is not detectable at all, you are causing great destruction. 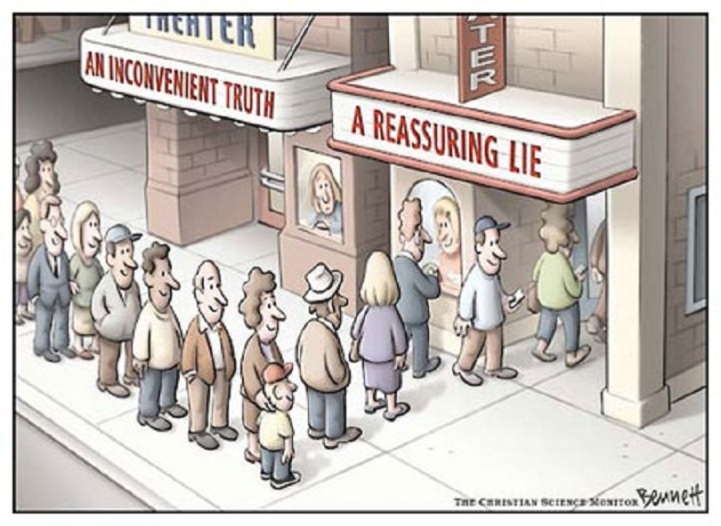 The stance of advocates against this technology, science, the laws of electricity and physics say we are vulnerable at levels far below ‘thermal effects’, this being called ‘non-thermal’. That is your controversy right there explained. They say nothing happens until you heat up, ‘we’ say you are disrupting every cell, frequency, signal and nerves of the body. Remember admitting this would instantly hold the military and telecoms accountable for untold numbers of deaths and diseases that have occurred. Liability is being avoided for the sake of profit, which in the end is the true driver of this technology. “While there is no federally developed national standard for safe levels of exposure to radiofrequency (RF) energy, many federal agencies have addressed this important issue. In addition to the Federal Communications Commission, federal health and safety agencies such as the Environmental Protection Agency (EPA), the Food and Drug Administration (FDA), the National Institute for Occupational Safety and Health (NIOSH) and the Occupational Safety and Health Administration (OSHA) have been actively involved in monitoring and investigating issues related to RF exposure. For example, the FDA has issued guidelines for safe RF emission levels from microwave ovens, and it continues to monitor exposure issues related to the use of certain RF devices such as cellular telephones. NIOSH conducts investigations and health hazard assessments related to occupational RF exposure. Federal, state and local government agencies and other organizations have generally relied on RF exposure standards developed by expert non-government organizations such as the Institute of Electrical and Electronics Engineers (IEEE) and the National Council on Radiation Protection and Measurements (NCRP). Since 1996, the FCC has required that all wireless communications devices sold in the United States meet its minimum guidelines for safe human exposure to radiofrequency (RF) energy. The FCC’s guidelines and rules regarding RF exposure are based upon standards developed by IEEE and NCRP and input from other federal agencies, such as those listed above. These guidelines specify exposure limits for hand-held wireless devices in terms of the Specific Absorption Rate (SAR). The SAR is a measure of the rate that RF energy is absorbed by the body. For exposure to RF energy from wireless devices, the allowable FCC SAR limit is 1.6 watts per kilogram (W/kg), as averaged over one gram of tissue. Some health and safety interest groups have interpreted certain reports to suggest that wireless device use may be linked to cancer and other illnesses, posing potentially greater risks for children than adults. While these assertions have gained increased public attention, currently no scientific evidence establishes a causal link between wireless device use and cancer or other illnesses. Those evaluating the potential risks of using wireless devices agree that more and longer-term studies should explore whether there is a better basis for RF safety standards than is currently used. The FCC closely monitors all of these study results.However, at this time, there is no basis on which to establish a different safety threshold than our current requirements.(source). Every organ of our bodies operate with their own polarized frequencies. Our brains, our hearts and our nervous systems all operate using magnetism and the electrical transfer of energy. Doctors attempt to bring someone back to life when their heart has stopped, athletes use biorhythmic pulses to help induce faster twitch muscle action and psychiatric hospitals use mental shock to alter brain waves in patients. There is also pulsed frequencies, like what makes a heart beat and the continuous electrical flows which allow our operating system to stay within a certain range of frequency. Alter that frequency and the cells in our body begin to mutate and perform sporadically altering everything from our moods to our abilities to think and act clearly to our reproduction systems. Physics now tells us that if we can change either the magnetic field or the electrical field of the atom, we literally change that atom and its elements within our body. Timeout for Sidebar that makes one go WTF?? What is the real agenda?? ..for the sole reason to ‘bring awareness’ to breast cancer’? ?, which everyone is already well aware of?? 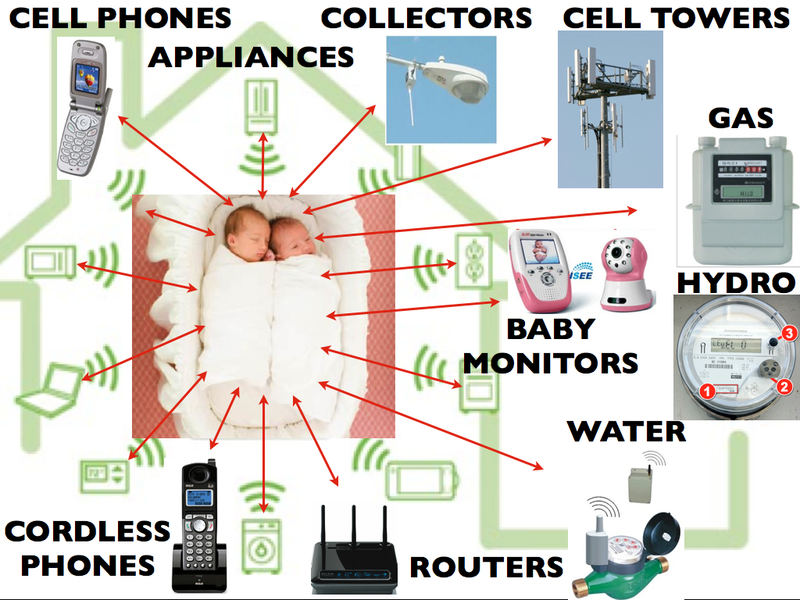 We have ever more powerful (more radiating) ‘smart’ cell phones on our person, wireless phones and wifi throughout our homes and office. Blue tooth wireless in our cars and even your keyless remote car and garage door opener’s that operate in these same frequency bands of long wave radio and micro waves. Most of these devices are always in search pulse mode sending out low magnetic waves. And don’t forget the ‘newest’ fads of WiSee gesture recognition devices that can remotely control your audio, tv, lighting by wireless radiation that is constantly scanning you (source) and the Google Glass, set directly next to the temple to your brain emitting radiation (source) and Wireless ‘Smart’ watches that will monitor your bodies like taking your pulse and reading your vital signs. (source). The new Apple 3G Ipad has 5 Antennas (source) and surely we will be seeing 5G, 6G, etc. until we reach critical mass of ‘Oh Gee, look at everyone with cancer” moment when the masses figure out all the latest tech they tote and wear is killing them. “Plans to use wireless technology to ease traffic congestion, regulate motorway speeds and monitor people’s personal health were set out on Wednesday by the broadcast regulator Ofcom. In a briefing, the Ofcom chief executive Ed Richards set out plans for the future use of radio spectrum, which he said was of “vital” importance to the UK economy, contributing an estimated £52 billion a year. Explaining that spectrum supply was under pressure from rising demand from smartphone and tablet use he outlined futuristic projects for maximising the resource. Over the next six months, partners including Microsoft, BT and Google are to take part in road-testing “white space” technology to exploit currently unused spaces in the broadcasting frequency band. Keep in mind, the military has 2 objectives: to understand “Can we hurt people with this?” and “How do we protect our side if the other side has this weapon?” So ALL sides and ALL militaries (Russia, UK, USA, Canada etc.) after learning a thing or two started to play around with this technology and as they went further, most of the projects went underground. Why? This happened because they figured out that this may be the greatest weapon known to man, if not at that time, certainly in the future. It is invisible, can travel large distances, costs very little, is tasteless, odourless, you can’t hear it and when being hit by it, the enemy has no idea it is even happening. If you want to dig into this further, a great, possibly the best source for data on all of this is here:http://jenniferlake.wordpress.com/2012/06/21/emf-killing-fields/Recall why military docs are so important. They only want to know exact specifics, no lawyers, no lobbyists etc. “Can they kill us? Can we kill them?” That’s it. Here is some more of what they found. Part 1 http://bcfreedom.wordpress.com/2012/09/24/death-lies-and-mutations-what-the-military-kept-from-the-public-on-microwave-radiation/ had a lot to do with pregnancy and babies. Take a look down at the part of the doc here referencing “Genetic and Chromosomal Changes”; To even see one thing in this column is alarming. But look at #3. Recently released secret documents have been revealed that the government, along with mega companies Google, Microsoft, et. al and the elite universities plan to roll out a entirely new private/public spectrum of significantly more radiated power that will net them $3.2 TRILLION dollars over the next decade. It is nearly impossible to escape wifi radiation, yet the evidence is overwhelming that it is making us very ill and even killing us by attacking us at the molecular cell level, especially our children, as you can read below. Science has shown that we have heightened senses of awareness, intuition, integrity and a general feeling of well being when our energy fields are clear, in normal operating ranges and working properly. This fact is beautifully expressed in this you tube talk by Manly Hally some 40 years ago In this speech he explains how our electromagnetic fields are critical to keep our physical, mental and spiritual states of being active. He states that when our natural vibrational frequencies get out of sync we are prone to get more mental and physical illness’, become more lethargic and have increased organ failures like heart attacks. (Source). Ever increasingly adults are getting ‘tweaked’ by being exposed to too much wireless radiation. 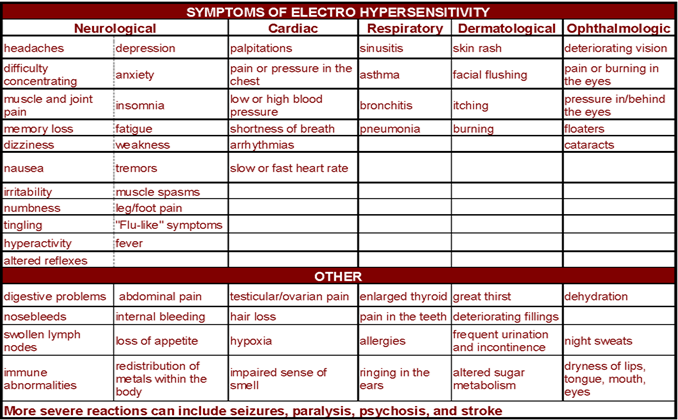 I have several friends who have moved, or are trying to move up into our area because they have EHS and it makes them physically ill to be around any EMF. This does not bode well for the children who are being exposed with same radiation but with much less developed immune and skeletal structure. (Lloyd Burrell, Contributor) Tom Wheeler, former head of the Cellular Telecommunications & Internet Association (CTIA) and frontrunner nominee to become the next Chairman of the Federal Communications Commission (FCC), allegedly suppressed and biased research from the nation’s largest cell phone health research project while he served as head of the CTIA. Wheeler’s nomination comes at a critical time. The FCC is responsible for setting the U.S. safety standards that are supposed to protect people from radiation emitted by cell phones, cell towers and other wireless technologies. These safety standards, widely considered to offer little protection to the general public, are currently under review. In 1993, a gentleman named David Reynard appeared on the Larry King Show announcing he was suing the wireless industry. Mr. Reynard alleged that the fatal brain tumor suffered by his late-wife had been caused by cell phone radiation. The deceased woman’s doctor gave a vivid and visual demonstration using an x-ray of the tumor showing that the location of the tumor corresponded exactly with the location of the cell phone’s antenna. The public’s fears were aroused, Telecoms shares took a hit and the cell phone industry started looking for solutions. In his capacity as president for the wireless industry’s trade association, Wheeler struck a deal with the Food and Drug Administration (FDA). The industry would fund and conduct a major study on the safety of cell phones; in return, the FDA would agree not to regulate cell phones until this research was complete. Enough of the biased research. The public deserves to know about the dangers of wireless and similar technologies in addition to proper protection from them. “Traditionally it has been possible to suppress individual freedom through the application of physical coercion through the appeal of ideologies through the manipulation of man’s physical and social environment and more recently through the techniques, the cruder techniques of psychological conditioning. The Ultimate Revolution, about which Mr. Huxley will speak today, concerns itself with the development of new behavioral controls, which operate directly on the psycho-physiological organisms of man. That is the capacity to replace external constraint by internal compulsions. As those of us who are familiar with Mr. Huxley’s works will know, this is a subject of which he has been concerned for quite a period of time.” Opening remarks for Mr. Huxley’s speech in Berkeley, 1962. Silent Weapons for Quiet Wars– Planned Genocide by the Wealthy Elite? Energy is recognized as the key to all activity on earth. Natural science is the study of the sources and control of natural energy, and social science, theoretically expressed as economics, is the study of the sources and control of social energy. Both are bookkeeping systems: mathematics. Therefore, athematics is the primary energy science. And the bookkeeper can be king if the public can be kept ignorant of the methodology of the bookkeeping. In order to implement this objective, it was necessary to create, secure, and apply new weapons which, as it turned out, were a class of weapons so subtle and sophisticated in their principle of operation and public appearance as to earn for themselves the name “silent weapons.” Everything that is expected from an ordinary weapon is expected from a silent weapon by its creators, but only in its own manner of functioning. It makes no obvious explosive noises, causes no obvious physical or mental injuries, and does not obviously interfere with anyone’s daily social life. Yet it makes an unmistakable “noise,” causes unmistakable physical and mental damage, and unmistakably interferes with the daily social life, i.e., unmistakable to a trained observer, one who knows what to look for.